These events are real crowd-pleasers, and they raise critical funding for Renfrew Institute’s educational programs. What a great way to enjoy yourself while helping us fulfill our mission to the community! Underwriting support provided last year by lead sponsors Drs. Jerzy Kornilow O.D. & Alison Ridenour, O.D., Antietam EYE Associates and Hadley Farms Bakery, Inc., with additional support provided by Dave Neterer, Sterling Financial Management, and Total Vac. Held in conjunction with Earth Celebration Day & Festival of Art. 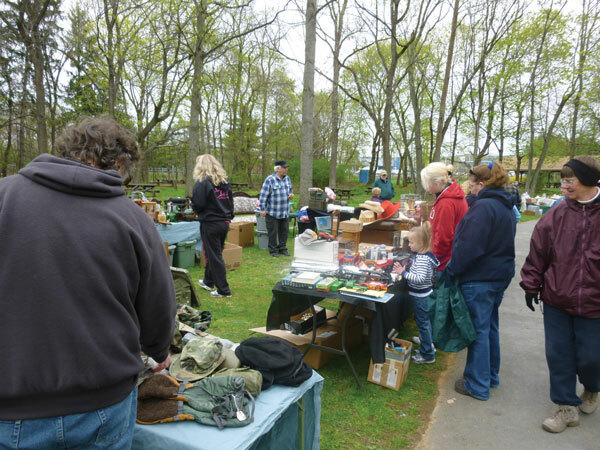 During the yard sale, visitors enjoy the thrill of the chase as they look for bargains or sell their own discards for extra cash. It’s a perfect market for buyers and sellers, and the institute makes money on the space rentals! Check back for the Yard Sale flyer and registration form. Chesapeake Bay Supper—2019 is our 22nd annual event!! Underwriting support provided last year by lead “Blue Crab” sponsor, FirstEnergy Foundation on behalf of West Penn Power, “Landlubber” sponsor, Keller Stonebraker Insurance, with their Waynesboro division, Craig, Friedly, Potter and Moore, and by Advanced Financial Security, Inc., Caroline Dean, Denny’s Garage, Foreman’s Rare Coins, Matt Gunder, Kirsten Hubbard, Chet and Betsy Mauk, Noelker & Hull Associates, Inc., and Savage Family Pharmacy, Inc.
Here’s an event that’s definitely all it’s cracked up to be! Members, friends, and families come together at Waynesboro Country Club to support Renfrew Institute with a fabulous evening of food, fun, and frolic. Bid it up during the silent and live auctions. Great items! Sponsorships are available. Reservations are required; check out the Bay Supper invitation with all the details and reservation form. Or, you can make reservations via PayPal with the “Buy Now” button below. Note: A PayPal account is not required to purchase tickets by credit card using this button. IF YOU USE PAYPAL for Bay Supper Reservations: Please note that reservations purchased with PayPal have 3% added onto the price. This extra amount covers the transaction fee that PayPal charges our organization for the convenience of online payment options. Thank you! Bargains abound at the Recycle-Reuse Earth Day Yard Sale. 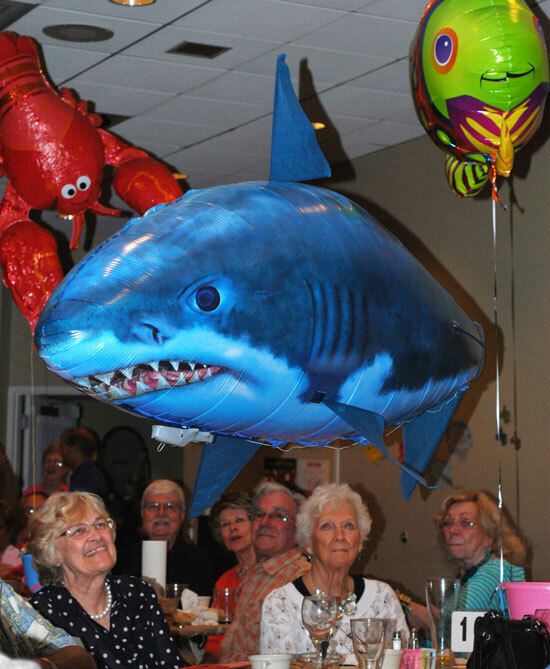 Bay Supper fun—giant shark overhead! Salamander Scramble —12th Annual Scramble! Visit our Scramble Event Page for more details and downloadable registration and pledge forms. 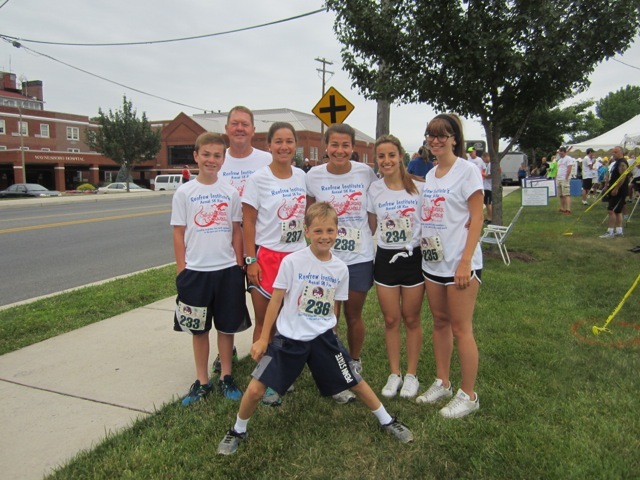 Underwriting for this event provided by lead underwriter Arlene Unger, ReMax Associates, Grove-Bowersox Funeral Home, CFAR/Waynesboro Running, Cornerstone Family Dentistry, John and Erin Hershey, Cermak Technologies, Inc., Eichholz Flowers, and Waynesboro Physical Therapy. Scrambling is a family affair for the Mannings! Please consider adding 3% to your donation amount so that 100% of your contribution goes to Renfrew Institute. The extra amount will cover the transaction fee that PayPal charges our organization. For example, if your donation to support a Salamander Scramble team member is $20, please make your PayPal donation in the amount of $20.60 (20 x .03 = .60). Come and enjoy pumpkin carving, hayrides, bluegrass music, and a pumpkin-hurling trebuchet at this popular joint fundraising event. Great food includes the signature black bean soup, cider, homemade bread, and much more! Proceeds from admissions, pumpkin sales, and other items benefit both Renfrew Institute and Renfrew Museum and Park. 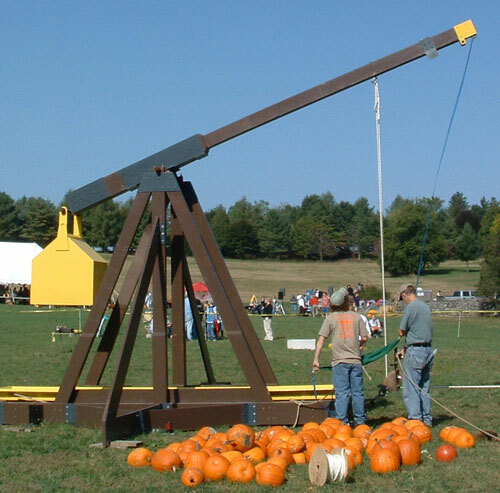 The pumpkin-hurling trebuchet is a popular attraction during Pumpkin Fest.